Did you know that Advent begins two weeks from Sunday? If I'm going to be intentional about celebrating this season with my family then I need to be on the ball, especially since we're going to be traveling for Thanskgiving. It's so easy for my good intentions to get lost in those busy days between Thanksgiving and Christmas. I did a little bit of research and planning yesterday afternoon, triggered in part by a book I checked out from the library last week. The book is The Adventure of Christmas: Helping Children Find Jesus in our Holiday Traditions by Lisa Whelchel. Let me back up and little and explain a little of what Advent is. It's easy to assume we all know and understand, but that's often not the case. Advent is the season on the Christian calendar that precedes Christmas. It begins four Sundays before Christmas and is basically a time of preparation and expectant waiting for the birth of Christ. As believers in Jesus, we re-tell and remember the stories surrounding Christ's birth, and we look for his second coming. I believe it's also a season to reflect on Emmanuel, God with us, in our day-to-day lives. One way our family celebrates is by using an Advent wreath. Here's a pic of ours that I took last year. Every night before dinner, we light the appropriate candles--one each week, and the middle one on Christmas. I have a small booklet that a friend gave me that has scripture readings for each week. There are responsive readings too, and we usually learn a new one each week to say at dinner each night as we light the candle. 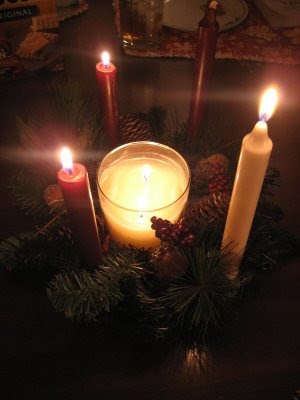 An Advent wreath doesn't have to be fancy. I bought cheap candleholders at the thrift store one year and then bought a circular garland (above) at Michael's--with a 50%off coupon. The traditional candles are purple (3) and pink (1) but I've had a hard time finding those colors some years, so I just go with whatever I have (or whatever matches my kitchen decor). If you do a google search, you can find tons of info about Advent wreaths--including how to make them, how to use them, what each candle represents, and the history of the tradition. I like that our wreath is the centerpiece on our table and a constant visual reminder of what the season is all about. I referred to Advent earlier as a season of expectant waiting? I don't know very many people who enjoy waiting, do you? 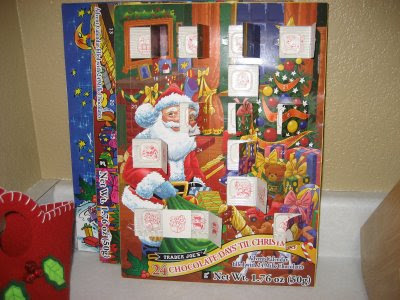 An Advent calendar makes waiting a little easier for children. They can be simple or elaborate. Here's one we've had since Will was a baby. Each day leading up to Christmas, my kids pull an ornament from the pocket and hang it on the tree. They love it. They also love these chocolate Advent calendars. I bought them each one at Trader Joe's last year for $1/each, and I plan to buy more this year! Remember when I said I was feeling crafty but didn't know what I wanted to make? Well, I found an idea! 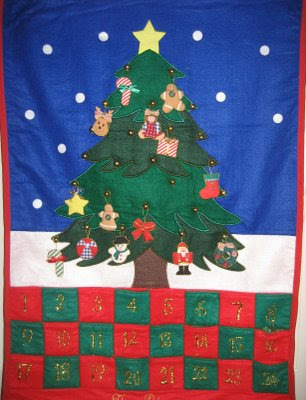 I bought the stuff today to make an Advent calendar like this one. (This link is SO worth clicking on!!!) I haven't decided what to put inside for each day, but I'm sure that it won't be candy. I want to do something different. More along the lines of "presence" than "presents". You get the idea! My goal is to make time to do something together each day. Please feel free to add to my list! I also just love, love, LOVE this video. Actually, I'm sharing two. They're both fabulous. If you have time, watch them both...because it shows what a difference we can make if we consumed less and gave more!!! I mentioned this book at the beginning of this post and it has some good craft and recipe ideas for kids. I love that it explains the history behind some of our traditions--Christmas trees, lights, gifts, etc, and gives you ideas for weaving faith discussions into things you probably already do. I also pulled out a few new ideas I want to try this year. Here's a couple more of our favorite Advent/Christmas traditions. It's hard for me to write a post about Advent and not mention John's book. We intend to read through it as a family this season! You have no idea how excited I am about that! I strongly believe that before we step into the season of Advent, we need to celebrate Thanksgiving and be reminded of how much we have to be grateful for. That's why it feels a little weird to post this today. BUT...more than anything, I desire Advent to be reflective, calm, and focused. And for me, none of that happens without some planning and some intentional living. So...I've been thinking along those lines this weekend. Wanna share your Advent ideas, traditions, or intentions? I'd love to hear them! we use the advent wreath in church. and my kids have always enjoyed our advent calendar...it was mine when I was young! They argue now about who will inherit it....hmmmmmm. what an amazing blessing it was to our family!! It was the most wonderful christmas ever and we have started a new tradition. I love this so much, Mer. I'm going to try really hard this year to get my act in gear and start some of these Advent traditions with my family. We get so busy with the hustle and bustle of just "stuff" during the season, that I think we do sometimes lose focus. Thanks for a bunch of GREAT ideas! Thank you for giving me the "intentions" option. I intend to be more focused this year since I won't have the distraction of getting the kids to school in December since they're on break. I'm going to have them focused on gifting to others as we are off, and also helping me in the decorating instead of killing myself doing it alone. I love the Advent wreath idea. I have a sixty jillion of those wreaths in the attic, so I'll repurpose one for our use. For a traveling Advent wreath we have used small glass tea light holders that can stack. We would stack up four and put them in our bag as we traveled so we could have our Advent wreath each night. Your Advent wreath is beautiful. I would try looking for pink and purple candles in the spring. Maybe around Easter? I like that you talked about "intentions" too because I think sometimes we have so many good ones, but so many that it is unrealistic. Mine will be minimal this year since I'm having surgery on my right hand 12/3... But I think God is using it as a way to help me "minimize" this year & I have such peace about it. What an absolutely beautiful tradition and one I know your kids will always remember!!!! Mer, I'm SO glad you posted this. I've never participated in Advent before and remember reading about what you guys were doing last year and wanting to try it this year. I know my girls would love it! Thanks for reminding us how quickly this will be here!! They passed out the family advent calendars at church this past Sunday and Madeline helped herself to all the stickers. I had to carefully peel them off the Old Maid cards and re-stick them in the little booklet. Growing up Methodist...i'm all about Advent. But now that we have no home (ha!) I'll be curious to see what happens to our Advent celebrations, expectations, traditions. I hope we can keep it alive and going. I haven't ever done an advent wreath or anything before. You've inspired me to! I remember reading about it last year here and on other blogs. Thanks for doing this a little early, it will help get me organized in time to really enjoy it with my family. Off to check out the links! Because I'm a huge fan of lists.